Apple's music creation tool for Mac, GarageBand, was given a minor update on Thursday which reintroduces the ability to export songs in the MP3 file format, while also offering new drum sounds and enhanced accessibility. GarageBand version 10.0.2 is now available for download on the Mac App Store. In addition to adding the option to export in MP3 format, it is also said to improve stability and address what Apple has characterized as "minor issues." The free update also includes three new virtual "Drummers" and accompanying drum kits for the genres of rock, songwriter, and R&B. These new additions will be available to those who have purchased or choose to buy the complete set of GarageBand sounds, loops and drummers via a one-time in-app purchase. 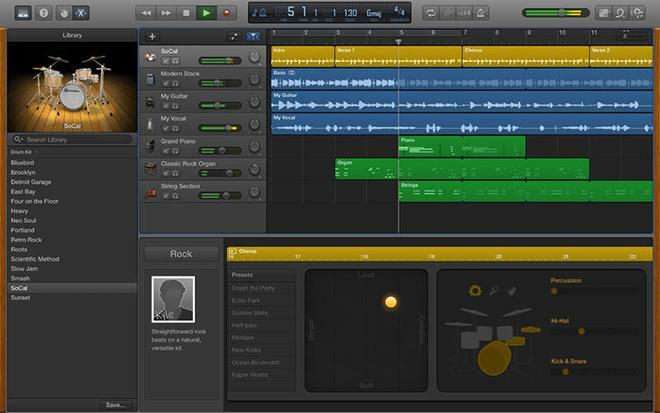 GarageBand is one of three options in Apple's consumer-oriented iLife suite, being joined by iPhoto and iMovie. All three applications come free with the purchase of a new Mac. The last update to GarageBand arrived in November, bringing minor tweaks and performance enhancements to Apple's casual music creation tool. Version 10 of GarageBand was released on the same day as Apple's latest Mac operating system, OS X Mavericks, last October, alongside revamped version of iMovie and iPhoto.